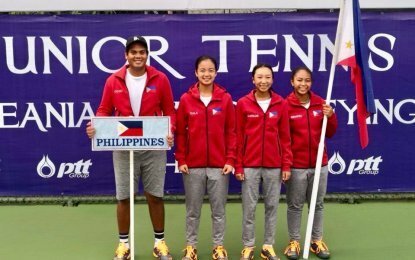 MANILA — The Philippines bowed to Thailand, 1-2, on Wednesday but still advanced in the quarterfinals of the (Under 14) World Juniors Tennis Championships Asia/Oceania Final Qualifying in Nonthaburi, Thailand. Ma. Carmencita Isabela Carlos lost to Salakthip Ounmuang, 3-6, 2-6, in the first singles but Alexandra Eala won over Lanlana Tararudee, 3-6, 6-2, 6-3, in the second singles. However, Carlos and Eala surrendered to Ounmuang and Tararudee, 2-6, 6-4, 7-10 in the doubles. Thailand, which topped Group B with a 3-0 win-loss record, and the Philippines, which has a 2-1 slate, will advance to the quarterfinals on Thursday. Thailand defeated Lebanon (3-0) and Kazakhstan (3-0) while the Philippines won over Lebanon (3-0) and Kazakhstan (3-0) in the round-robin. Meanwhile, Chinese Taipei beat South Korea (3-0), Malaysia (3-0) and Hong Kong (3-0) to finish on top of Group A. South Korea prevailed over Malaysia (3-0) and Hong Kong (2-1) to also reach the quarterfinal round. The quarterfinalists in Group C are China and Australia. China conquered Australia (2-1), India (3-0) and Sri Lanka (3-0), while Australia won over Sri Lanka (3-0) and India (3-0). In Group D, Japan downed New Zealand (3-0), Indonesia (3-0) and Uzbekistan (3-0) to advance to the next round together with New Zealand, which won over Indonesia (3-0) and Uzbekistan (2-1).